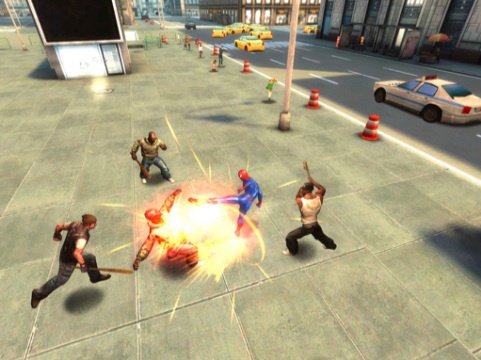 Our spider sense tingles for Gameloft's thug-pummeling beat-em-up. Gameloft's Spider-Man: Total Mayhem is one of the best third-person beat-em-ups on iOS, so expectations are high that the company's newest title, The Amazing Spider-Man (based on the upcoming film), will do the web-slinging superhero justice. We just came back from playing this promising game, and despite a nasty bug, the app appears to have what it takes to become a must-have for comic book fans. What stands out the most is the open-world. You don't run from mission to mission, but instead wander around a smaller version of New York City, where you're free to basically do as you please, electing to follow the story loosely based on the movie (complete with main villain, The Lizard) or breaking off from the primary objectives to explore at your leisure. It seems criminals are up to no good on a daily basis, so much of what you'll do involves saving people by beating up evildoers. To that end, combat is both fast-paced and fun. Spider-Man wallops bad guys with speedy punches and kicks, then temporarily immobilizes them with his webbing ability, wrapping up their legs and torsos. 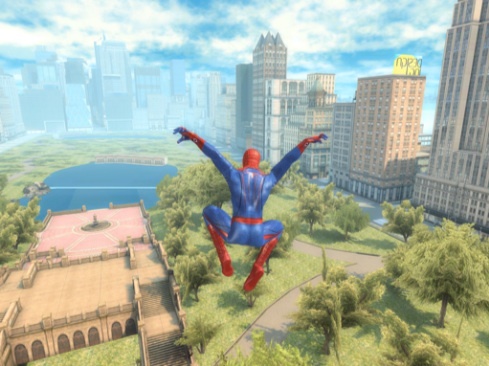 Meanwhile, Gameloft has apparently channeled Activision's Spider-Man 2 when it comes to moving through New York. Armed with a virtual analog stick and web button, players can effortlessly fly through the Big Apple high above the streets, landing on rooftops or climbing up the sides of buildings; unfortunately, we were unable to test the game's boundaries with an attempt to reach New Jersey. When approaching the ground, numerous cars and people slowly come into view. Once there, Spider-Man automatically flips his body across vehicles instead of simply bumping into them, a tiny feature that makes exploring NYC user-friendly and mostly hassle free. On the downside, there's quite a bit of pop-up, where buildings and other objects just randomly appear while the game attempts to process the environment. We also managed to crash the app a few times, though Gameloft said this issue would receive a fix well ahead of the game's late June release. Taking this into account, we think quite highly of The Amazing Spider-Man, and look forward to playing the final product. Cross your fingers that both it and the movie are equally good.